Inner Work Meditation (Heart): I still didn’t see the owl I was hoping to see today. But the hope of seeing it keeps me going even on cold days or days I don’t feel like walking. And in the pursuit of that owl photo I have seen so much more. Today take ten minutes to reflect on what your goals were yesterday and what you saw along the way. Did you accomplish your goals? How much more did you see and experience while trying to accomplish those goals? Bring that inspiration into today. 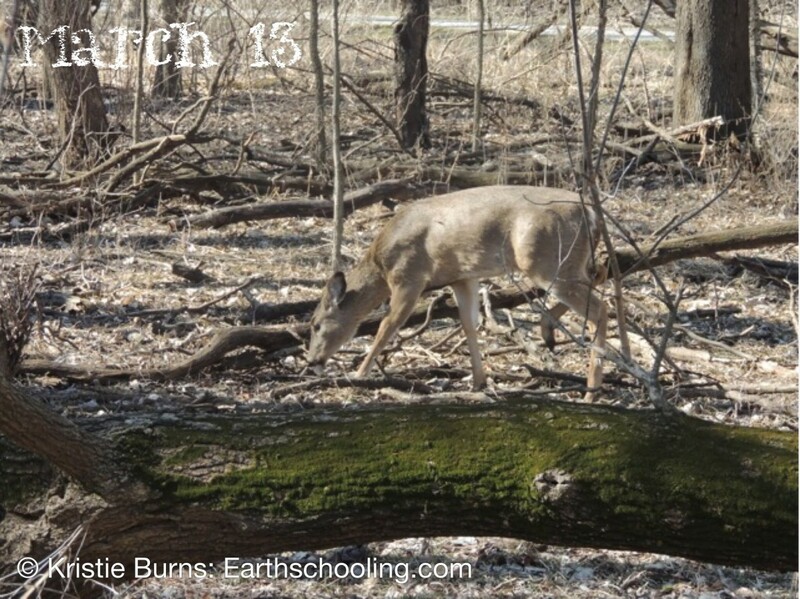 Nature Walk Idea (Head): Learning nature is like learning to sight read. Sometimes you just see it as a feeling. You start by learning the basic letters of the nature alphabet – tree, bird, plant, flower. Sometimes you take apart the experience and make each nature scene a practice in visual phonics. Ultimately, however, the true child of nature will be able to just see something in nature instantly and have that instant translate into a feeling or a recognition. On your nature walk today take note of the things in nature you already “sight read” and the things you are still learning about. 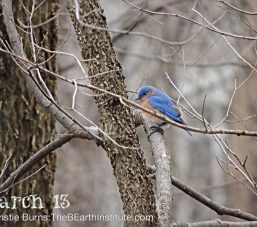 When you see the bird in the picture above do you immediately know it is a bluebird in the same way you know someone you see in your home? Or do you need to look it up online to know what it is? Today look up the name of at least one thing you see on your walk so you can add it to your “sight reading” list in the future. Would you like to incorporate a reading block into your daily lessons? Check out our First Grade April Lessons, First Grade Language Block, or Second Grade Language Block. Photography Notes (Hands): Today your assignment is to take a photo (or draw a picture, write or use another artistic form of expression) and use the theme of contrasting bright against dull or bright against dark as your topic for the day. 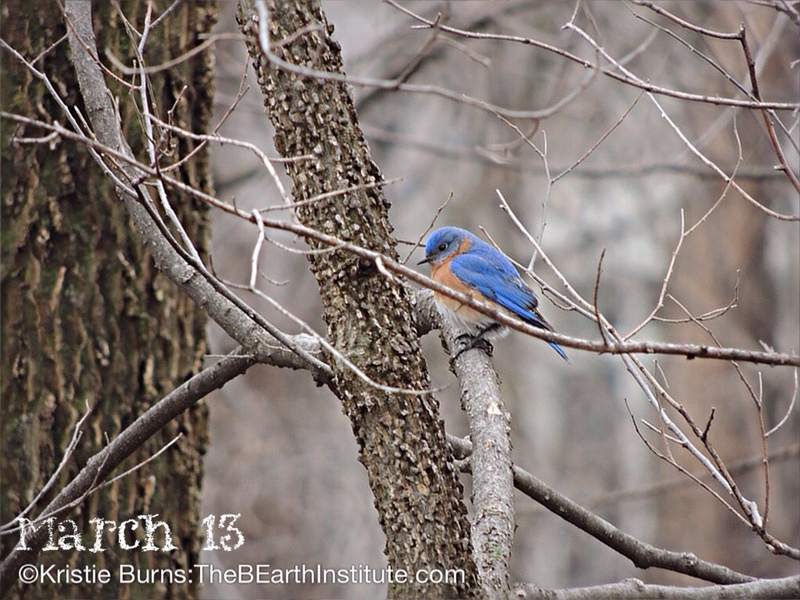 In the photo I took today the bright bluebird stands out from all the grayish brown dead trees around it. Notice how you can use color to make your subject stand out in a photo or other piece of art. Use this tool today in your work. *An ABC poem is a poem that has five lines and creates a mood, picture, or feeling. Lines 1 through 4 are made up of words, phrases or clauses while the first word of each line is in alphabetical order. Line 5 is one sentence long and begins with and E or any other letter. Words do not need to rhyme.